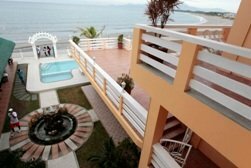 Looking wonderful resort in Bataan, Phi-Phi resort located at Morong, a beautiful and excellent place for honeymoon. Consider as the perfect spot to unfurl from busy work life. While you are in the beach, savor their delectable Kapampangan food, snap the sunset from your own beachfront room or take a night swim in our private pool and have nice beaches. Morong, Bataan is an awesome place for vacation together with your loved ones and friends. This resort is an ideal venue for corporate outing such as baptismal, weddings and birthday parties or team building activities. Have fun with our outdoor amenities like beach volleyball, rubberboating, obstacle course, bonfire etc. Come and stay at Phi-Phi resort for long vacation. Royal Suites - Beachfront room with unhampered sea view located at the third floor. Enjoy a more private and quiet area at the balcony, overlooking the infinity dip pool. Suite Room -Beachfront room, air conditioned, balcony, private CR with hot & cold shower, refrigerator, Wi-Fi access. Super Deluxe - Bay view room, air conditioned, balcony, private CR with hot & cold shower, refrigerator, Wi-Fi access. Deluxe Room - Air conditioned, private CR with hot & cold shower, Wi-Fi access. Supreme Dorm - Air conditioned, private CR with hot & cold shower, Wi-Fi access. Family Villa - 2 bedrooms, living room, kitchen, refrigerator, microwave oven, dining area, private veranda, 2 toilet and bath with hot ans cold showers, pool view. Superior Room - Air conditioned, private CR with hot & cold shower, Wi-Fi access. Terazza Room - Air conditioned, balcony, private CR with hot & cold shower, Wi-Fi access. Veranda Room - Air conditioned, private CR with hot & cold shower, Wi-fi access. From Metro Manila, take the North Luzon Expressway (NLEX) to the Clark exit onto Subic-Clark Toll Express (SCTEX) to Subic Bay Freeport. *SCTEX combines into Tipo Road as it ways Subic Bay. Take Tipo Road until it ends, and then turn right. At the first traffic signal, turn left on Argonaut Highway. Proceed past Subic International Airport. Turn left at the T-junction on Triboa Bay on Corregidor Road. Continue through the Naval Magazine Security Gate and follow the Morong Gate road signs through the forest. Morong Gate is approximately less than half kilometers away from the Subic Botanical intersection road. Drive straight until the SBMA exit gate and drive all the way to Morong town proper. When in Morong town proper, turn right at J. Luna St. (there’s a Lotto Betting Station in one corner). Drive past the Catholic Church and turn left on the road where the Municipal Hall is. Drive straight until you reach the Phi-Phi resort.